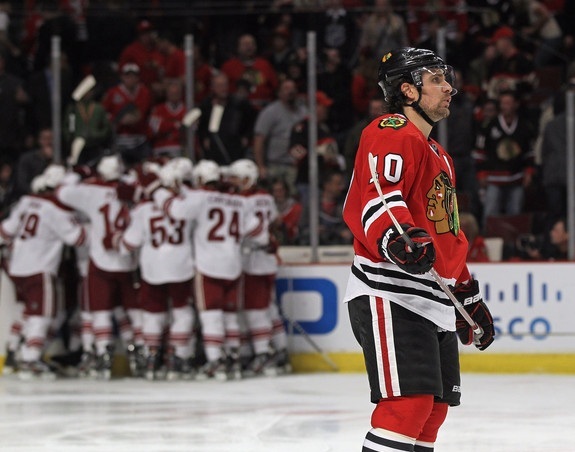 It has become clear that the 2011-12 Chicago Blackhawks ultimately failed because they lacked a number of key ingredients. We’ve already looked at one potential free agent addition they should make. Now, let’s consider one player who might be on the market this summer; the Hawks should certainly make a phone call to see if he is. The Blackhawks aren’t physical enough. This has been a problem since the dismantling of the Cup roster. The Hawks have drafted well and have a lot of size matriculating its way up through the organization, but we’ve seen in the playoffs that the Hawks need to add quality, battle-tested veterans to their depth; rookies cannot be expected to carry the load. The veteran forward in mind is listed at 6’4″ and 230 pounds. He was credited with only 42 hits in 82 games in 2011-12, but he was among the league leaders with 96 takeaways and added 26 blocked shots. The Blackhawks don’t have a legitimate #2 center. The Patrick Kane Experiment is a nice idea, but the Hawks are obviously a better team when he’s skating with Jonathan Toews. The problem, however, with having four superstars is that either one of them is being left out of the fun with a single line being overloaded or, more times than not, an inadequate center (read: Marcus Kruger) is skating between Marian Hossa and Patrick Sharp. The player in mind is a center, and has actually been a top-line player throughout his career. He won over 56 percent of his faceoffs this year, and his assist-first approach would fit perfectly in the Hawks’ top six. The Blackhawks special teams are awful. Chicago has tried almost everyone somewhere on either of their special teams, but the unfortunate reality is that they continue to come back to the same three or four players on every unit in every key situation. Frankly, they need to give Jonathan Toews a break at some point. The center we’re thinking of spends a significant amount of time on special teams (1:03 per game killing penalties, 3:22 per game on the power play). He scored four power play goals in 2011-12, but added 19 assists while skating with the man advantage. So who are we thinking of? 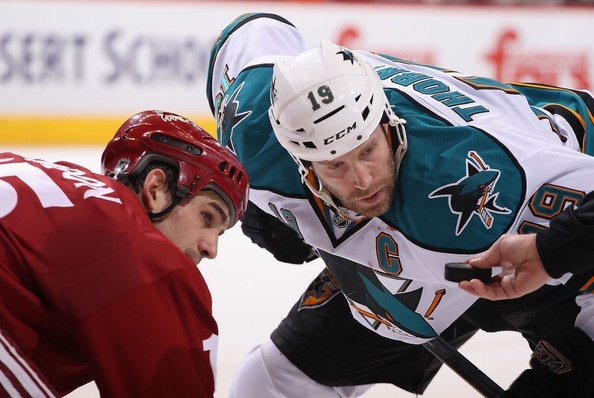 San Jose’s Joe Thornton, 32, has two more years left on his deal with a $7M cap hit. Is that a steep price to pay a veteran? Perhaps. But making him a second-line center would take a lot of pressure off the Hawks’ four star forwards. How soon we forget that was the knock on Hossa before he got here. Thornton alone wouldn’t solve all of the Blackhawks’ problems, but he would provide a remedy for a number of them. Last summer, Doug Wilson showed a willingness to move almost anyone when he traded Dany Heatley and Devin Setoguchi to the Minnesota Wild. If he looks to mix up his formula again this summer, Chicago should at least see what the cost would be to get Thornton out of the Shark Tank. Interesting idea. I like it, but I wish there was a way around that enormous cap hit. He would make an awesome #2 center and his pass-first mentality would be awesome for our wingers. I just worry that he wouldn’t be physical enough just like the rest of our lineup, but then again, I’ve never watched him play while being unbiased. How bout going after Jordan Stall. His contract is over and is a RFA who likely won’t be able to resign with Pittsburg’s bloated payroll. On any other team he’s a 1st or 2nd line center. Great on the PK! Toews, Stall, Bolland would look amazing as a top 3. Believe there are a lot better ways to take a seven million dollar cap hit. You can’t be serious and its not that far out of season to be that desperate for something to write about. So WHAT? REALLY?? First, to Keith – the season’s over. Time to look ahead. If you would prefer looking back at the ’11-12 team, be my guest. Re: Jordan Staal – he isn’t going anywhere. I would love to have Staal, but it ain’t happening. Certainly not w/out Bolland + a couple top prospects being involved, and I’m not a big fan of adding guys the Hawks would intend to keep long-term that need a new deal before Toews right now. I think Q breaks the lines / pairings up too much and too fast. The guys don’t get a chance to gel. I know this might be blasphemy, but maybe Coach Q is the problem. This team is way too talented to be a 6 seed with a 1st round exit. The PP was nauseating this year. Kane is woefully inadequate below his own goal line, helping out the D, which is imperative for the center position. Two centers that are going to win >55% of their faceoffs and score 70-80 points. Kane and Hossa where the belong: right wing. The magic of Sharp-Toews-Kane back together. And, on a line w/ Thornton & Hossa, a Calder for Saad. Obviously there would have to be assets moved to acquire the final two years of Thornton’s deal (which is key: only 2 years), but he has the size and skills to help a number of areas that failed the Blackhawks in 2011-12. I just feel Jonny Odulya was a great player for Chicago and yes I dont understand why coach Q wanted to break up that chemistry Hossa, n Kaner had while captain serious was out… Also drove down to Phoenix for the first few games.. Jamal Mayers played well and then he gets sat hmm ???????? Just like Troy Brower why would we let him go ?????? What about Stalberg? I thought the line of Sharp/Kruger/Stalberg did well during the absence of Toews. I’m both hot and cold where it concerns Kane, which line he would make a good fit. Kane, still requires discipline when it comes to puck control, management and passing plays. I understand we are talking about moving forward from 11/12 season, but I’m a tad confused. I know who I would make an excellent addition to the Hawks scoring lines….?????? Didn’t Sharp play center during the cup run. I don’t remember him being awful…Would it make more sense to move him and get a LW or because we move Sharp to center we have to have 2 LW? Tab……….I had to read your article and your responses twice before I stopped laughing. However, after thinking about this with a clear head, Thornton is not such a bad idea. He has size, speed, some grit, he can score, he can handle the puck in traffic AND he can win faceoffs. Amanda, knowing how hockey players are, Toews would be the first guy to welcome him to the Hawks. Punches to the head are part of the game, dear, like it or not. Tab, Doug Wilson is going to want Hayes, Pirri or Saad to go along with Jahlmarrson, don’t you think? Or, possibly Bolland and Hayes for Thornton. Also, I think Thornton has a “no trade” clause. We may have to do a 2 year extension. Tab, as many times as I think you’re drinking too much “Mikita koolaid”, this makes sense. My brain is now awake, I can go back to work!! 7 is sooooo steep. We still have to address defensive issues. I’d be okay with the organization sitting on Crawford, but not on this current defense. We’re talking about packing another superstar into this already loaded lineup. Sure the PP leaves a lot to be desired, but is that a product of the players, or Kitchen? As far as the tough veteran theory, that’s been tried and tested this year. If we want to park someone in front of the net, we just resigned Carcillo, and Hayes hasn’t been tested there. We have the offensive pieces–Kane will most likely try his hand at center again, and Kruger is developing nicely. We also have prospects that play center. If the hawks want to spend anything near 7, I say bid on Suter with 5 or 6 million. I like the suggestion though the cap hit is a little high, but who do the Hawks give up to get him? Getting Thornton makes great sense. He would fill the #2c hole in a big way. The fact that he has 2 years left is ideal also. Gives McNeill or K. Hayes 2 more years to develope and assuume that role when Thrornton’s contract expires. If the hawks were willing to take on that kind of salary, they need to dump some in return. I would be interested in Jay Bouwmeester. I think his style fits perfectly with the Hawks and I wouldn’t be surprised if Calgary would take Hammer in return. Jay has never played with a decent team, and I think he could be special in the right environment. He has also not missed a game in 8 years. I find it interesting that he lists his favorite jersey as the Blackhawks and his best hockey buddy is Steve Montador. Colorado Av’s 2012 RFA (900k current cap hit) – Ryan O’Reily…. Jay Bouwmeester is one of the most overrated defenseman around. There are much better and cheaper options to fill out the back end. Bouwmeester had one good season in Florida and has been riding on that ever since then. He was something like a minus 20 this season. Not something the hawks really need to carry at this point. I love the idea of Thornton the only problem is what will we have to give up and 7 mil is a bit steep. He would fit in perfectly though, he is a very adequate center for the hawks line up. Plus he can play both ends of special teams which we desperately need. @ Tom I like fighting and I know it part of hockey but someone who took out toews for as long as he did is not ok in my book. @John Not sure the Sharks ever saw something in Hammer. I still think it was a calculated move by Doug Wilson to force the Hawks to overpay. He saw the Hawks as a hige conference rival. He knew they wanted him back and he made Hammer an offer. The Hawks eventually took a 3.5 million cap hit. I agree with the points you made. I also preferred Kane at center this year. He is clearly able to find more room to create at center. At wing the smarter teams have been able to seal him off along the walls where he can do little damage. Playing at center he should improve at the face off dot, and his defensive coverage should also get better with greater commitment. Can we use a big center to take some of the pressure off the captain sure why not? Thorton could be a good fit here, but he brings a big salary. More pressing for me is a physical d man to clear the front of the net and make opposing forwards wary in our own end. Only Seabs and Olsen fit that bill right now. The Hawks are too lean in the muscle dept up front as well so we could use a big winger/center to work hard in front of opposing netminders. The special teams rightly said by Stan are a big off season problem to address. Special team play and goal tending win/lose you so many games. This year was brutal in both cases. The talent on this team is high enough so the special teams were particularly frustrating this season. Does anyone know why Mayers did not finish out the Yotes series? It was my feeling that he must have been hurt, but talk of Q benching him was strange. Mayers was very good for us this year in the role he was assigned to play. He looked a little worn down as the season ran into this month, but again maybe he was hurt. I hope we keep him for next year as he really gave 100%. I am looking forward to seeing what the Bowman’s and Q can come up with in the off season. Losing in the first round is not acceptable for this team. Progressive changes are needed with the players and coaching staff. Good points by Tab and everyone else. I really enjoy reading this forum and the comments from fans who are not only knowledgeable, but passionate about their team. Isn’t Thornton the guy that punched Toews in the back of head skating back for a line change? Who would you give up for him? Is it the perfect move Tab, even if it is actually possible??? I don’t know, probably not. O’Reilly from Colorado is very intriguing as well. However, the idea isn’t without serious merit, again if it is possible…Thornton as a #2 Centre would not just help Tazer and the forwards, and the special teams, and the defence, and the goalies, and the coaches, and the (you get the idea)…but it would also HELP JOE THORNTON, a ton! But the other aspect to this move is that you would be able to put Toews, Kane, and Sharp together (a dynamite line, maybe the best in the NHL) without hurting the other 3 lines. Plus, you either get to put Viktor Stahlberg on the 2nd line and watch him continue to grow (with Hossa and Thornton) or as Tab suggested Brandon Saad, and give him every opportunity to dominate as a rookie. And even if a move like this cost us Bolland, Hammer, a prospect and a pick to complete, Marcus Kruger is more than ready to be our 3rd line centre, and Hammer simply isn’t needed here. If the Hawks added a Wideman type on defence to bout, we would have as good a chance as any for the Cup in 2013. Dustin Penner for a little over half the money that would have to be paid to jumbo. He can put the puck in net, matched up with the talent the Hawks have could/would help considerably. Penner was immovable against Vancouver. Dustin Penner? We just got done w/ Andrew Brunette. Why go thru that again? I can’t stand the big doofus. But that’s neither here nor there because if he were to don the Indianhead, he would be our big doofus and I’d be cheering for him. He is certainly a very good center and would be an ideal #2C for all the reasons Tab mentioned. I will resprectfully disagree with an earlier poster’s assessment of his speed – he is not fast by any stretch of the imagination, but he doesn’t need to be. There’s no denying his productivity, speed or not. But what is going the other way? I’ve got to believe Dougie is feeling the big chair getting warmer and he knows his window is closing soon. If my hunch is right and Wilson needs to win now, then wouldn’t trading Dumbo Joe be a step in the wrong direction? If he were to entertain the possibility, he is probably going to want the return players to be immediate impact players that help him get to the promised land before he’s is out of a job. And then there’s the $7M cap hit. Huet is off the books but Olesz is still earning NHL sized dollars to play in Rockford. It would obviously depend on which players were shipped to SJ, but unless it’s a couple $3M+ players, Rocky will need to agree to continue eating the Olesz contract and possibly Frolik’s $2.3M also. And then what about that top-4 d-man the team needs? OK – I’ve talked myself into it. I like the idea of Thornton centering the second line for 2 years. Say byebye to Joe in a couple years just about the time McNeill or one of the other prospects should be ready to step up in class. Yeah! Call Stan and tell him to get this thing done. Penner is only 29, about 230+, had some nice numbers w/ Edmonton and is 6’3″. Just keep an eye on him against St. Louis. We have a lot of time to evaluate some quality players that will be available and are still playing. Brunette is old and slow and it showed all year long. I am having a tough time burning that kind of money on Jumbo. Something about the guy I just do not like. I also have to ask what Glenn brought up in regard to Olesz. He is pulling down 3mil+ in Rockford. A big body. A failed project? An interesting assessment on hockey futures. Will he get a chance and fill the role requested? I know it was a forced deal to accept with the Campbell deal from Tallon. Big proponent of adding Jumbo Joe if it were possible. Much rather have him than Marleau. 2 years to run on his contract and it expires one year before the Toews and Kane deals run out. By then, should have an in house replacement for him. Also – without adding size up front and especially at the center position, how are the Hawks going to handle St.Louis or Nashville in the Central and other bigger physical teams like LA, Vancouver, Boston, NYR, Pittsburgh etc. Marcus Kruger sure isn’t the answer. I threw up in my mouth a little bit when I read the title but it does makes sense… A lot of sense… My brother mentioned this after the Sharks lost so I called him an idiot and really didn’t think on it again. Who/What goes the other way though? And what is the over under on the idiot that manages the D gets fired? This deal is becoming a DISASTER for Chicago, and certainly was for this season as Bowman did NOTHING (unless you call Oduya at the deadline a legit answer) with the money freed up from Campbell’s contract to address the top 3 DMan or 2nd line Centre issue. Brad, I agree with the loss of Soupy and everything you said about that deal. That is why I would’ve liked to see Bowman pull the trigger on Carter. What we got did nothing to help the cause. 5 mil cap hit long term, but a heck of a player to fit with what we already have. but that is old news now. 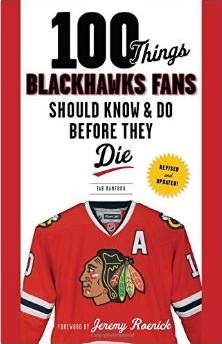 And I agree with the Kaner dissertation. I stopped counting how many times he whiffed on passes and shots in that series. Gou, I brought up Olesz because many fans (myself included) were disappointed when Stan did use the available cap space to do more to strengthen the team. But, that said, it shouldn’t be forgotten that Rocky paid Huet ($5.5M) and Olesz ($3.1M) to play elsewhere last season. In addition, some of the players have front-loaded contracts which resulted in a higher cash outlay than the respective salary cap hit for those players. So while it appears the Hawks chinsed out by not spending the $4M+ they were under the salary cap – in real $$$, they paid out around $15M more than the $64.3M salary cap. So while it’s easy for me and other fans to say “so what – it’s not our money – Rocky is rich – he should spend more”, Rocky probably takes a diferent view. I appreciate that Rocky agreed to have them play elsewhere in order to free up salary cap space for the Hawks. I’m not sure if it’s right to think he should continue to do so. Glenn, Well said. I knew the money was still laid out especially the Huet fiasco. Thanks Dale. Stan has the ball. It is up to him to show Chicago commitment to get us back on the mountain top. I believe that the hawks need a good goalie, i mean forget regular season play you need someone solid come playoff time. Crawford is good but the fact is the kid can’t steal games lets get someone legit like a luongo then we could adress the issue of getting tougher. HNIC Hotstove this afternoon. Pittsburgh may have to trade Jordan Staal as he’s a year away from free agency. NOW thats who I’d want. Forget Joe Thornton. Toews & Staal. Now thats an awesome one two punch. Brad you do realize that Campbell makes 7.14 million against the cap for another 4 years? That is a long time and not money you pay a guy to skate second pairing minutes. Leddy will continue to make steps forward to becoming that offensive D man, sorry you’re being inconvenienced and will have to wait. Lots of blame to throw around. Pretty common knowledge that Kane’s shooting percentage was off this year compared to the last few. Kane however was 9th in the league in takeaways and had a good year in terms of overall game improvement. IF they stick with him at C he will probably have a similar ceiling to that little Russian in Detroit down low. they will need to unload and play some young cheap skaters… a GUY LIKE Pirri would be great for them… too small and weak w/ us. Package him and Young D-man, Ben Smith or Bollig. He is only 23 yrs. old, playoff experience, size. In addition to a 2nd line center and a top 4 d-man, I would love to see Burrish back as the 4th line center. Our 4th line has contributed nothing since he was with us and we won the Cup. We need is personality back! It would make sense on the stat sheet, but I’m not to sure that is a good move in terms of chemistry. I think of Toews and back to 2010 him slashing Bolland’s wrist and dragging him on the ice with his stick……I don’t think the cap hit is worth it either. kind of off topic but what about a trade for Luongo to solve our goalie issue, keep denying it if you want but crawford is not a NHL starter capable of winning a cup at this point, way to inconsistent. I know Luongo is hated in chicago and is considered a choke artist by many but remember he did win a gold medal in ’10, maybe a change of scenery is all he needs. Nick, he has a big price tag for a long time. I would take Schneider anytime over him. Thornton for 7 isnt bad. Its only 2 years (less than Campbell mind you) and if we are dealing Stalberg and Hammer (added with our capspace) we can easily get it on the books. If he wants an extention… then we have problems. Staal would be great, but Pit wont give him up for cheap. They would want a guy who can play 3C, as well as a player to can contribute. From our end, I would start with Kruger and Stalberg and see where it goes. Maybe they might bite for the Kruger, Stalberg, a package of picks (at least 1 First-Round pick). Either deal would work for me. I have always loved Staal’s play. He has been a model of two way hockey since he broke into the league. But, I have liked Thornton going back to his Bruins days. Thornton is a habitual 50 Assist guy (and Olympic Teammate of Toews/Keith/Seabs) and playing next to Hossa/Saad would be very nice. And on the topic of Ryan O’Reily… ya, he would be a great add,which is why Colorado WONT get rid of him. If you want to add a 21 year old, less and 1M cap hit, 50+ point, first line PK Center, go back to playing NHL 12 (and even in the game thats not a easy trade to pull, Ive tried). Maybe if Colorado COMPLETELY falls on their face next year they will deal… but they were in the hunt, and dealing O’Reily would be a mistake. Staal for a package with Stalberg as the highest impact player going back is not going to happen, not if the first round pick you are talking about is Chicago`s and not some mysterious top5 pick you got in another trade. It’s a pipe dream to think another contender is going to hand us the fix to our biggest problem in exchange for a patchwork of depth players. They’d need a player back that helps them out right away, not someone whose best asset is being Tyler Kennedy with another year of ELC pay. Or would you give them Seabrook for Lovejoy and Vitale? The only plus we have for the Pens is the Western Division, otherwise I am sure they are more inclined to cut Toronto or Calgary a better deal than us, which incidentally might work better for Staal, as they’d hand him the #1 center spot on a silver platter with millions and millions of a 1C salary. RK- would you have thought we would have traded Ladd for Vishnevskiy and pick? Or Buff/Eager/Sopel for a prospect (morin), a first and a second? Or Campbell for Olesz? teams do what they have to do to stay under the cap. Crosby and Malkin account for around 15M, Martin/Michalek/Orpik/Legtang is another 15, Fluery/Neal/Kennedy/Kunitz another 15. That only leaves about 20 mill for 13 other players. Kennedy will be due a new deal next year, Crosby and Malkin are due for extentions, Cooke and Dupuis will be in the last year of their deals next year, and Niskenen is a RFA this year. Kinds sounds like the Hawks 2 years ago. Pittsburgh will need to pick their poison, and paying stall 5.5-6 mil to play on the 3rd line might not be in the cards. They would benefit more from aquiring 2 useable assets, and some package of a prospect and pick or multiple picks. they can then use the picks to build depth, or deal them to a team like calgary to bring in a guy like Iginla who. (so look at it like this. Chicago gets Staal, Pit gets Iginla, Kruger, Stalberg, Calgary gets 3 first rounders (1 from Pit, 2 from Chicago). We get our Center, Pit gets one year of Iginla to make a run (and the chance to resign him) and then two other useable assets, Calgary starts a rebuild. Now there is nothing stopping Pit/Calgary from dealing with each other… but this is a hawks blog, so im going to find a why to benifit my team, while looking at it with realistic eyes. No way on Luongo ! He’s a head case . I like the idea I’d Wideman and could live with Joe T . But we need a goalie who is reliable .